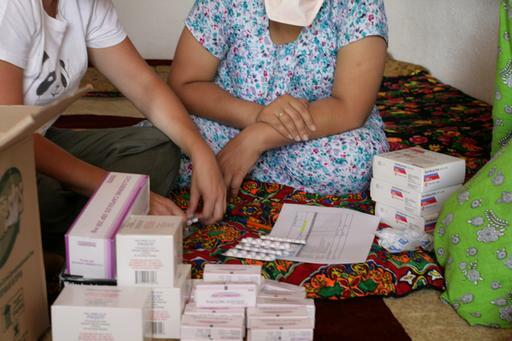 TB: "First TB Drug in 50 years"
Médecins Sans Frontières/Doctors Without Borders (MSF) welcomes the approval by the US Food and Drug Administration of bedaquiline, the first new drug active against tuberculosis (TB) to be registered since 1963. Today’s treatment for multidrug-resistant TB (MDR-TB) is a two-year course of up to 20 different pills per day and around eight months of daily injections. Patients are subjected to excruciating side effects, ranging from permanent deafness and persistent nausea to psychosis. Globally, only 48 percent of people who start treatment for DR-TB are cured. In MSF programmes, the cure rate is slightly better – 53 percent - but still unacceptably low. “Ministries of health and drug regulators need to work together to make sure people with MDR-TB benefit from this important medical advance as soon as possible,” said Dr. Balasegaram. The scale of the DR-TB epidemic is huge, with 310,000 new cases notified in 2011. But globally, only 19 percent of people thought to be infected are receiving treatment. “Scale-up of global DR-TB treatment has remained shockingly low, to a large degree because the current treatment regimen is so complex and costly for health programmes and difficult to tolerate for patients,” said Dr Francis Varaine, leader of MSF’s TB Working Group. "With simpler, shorter and more effective treatment regimens, we will be able to scale-up treatment and cure more people with DR-TB." In addition to bedaquiline, developed by Janssen, a second new drug that is active against MDR-TB called delamanid, developed by Otsuka, is undergoing registration by the European Medicines Agency and is expected to be approved for use in 2013. Together, the two new drugs represent an unprecedented opportunity to improve treatment for MDR-TB, and ensuring the drugs are combined and introduced in the most effective manner is extremely urgent.